Publication design is pretty foreign territory for me as a designer. And I don’t really read magazines, so I guess that’s why you don’t see many here. But V Magazine’s approach to the use of their logo on the cover is praiseworthy for its bold scale and crisp geometry. Especially when it points right at the hooha. This is the epitome of pretty much every cliché about tacky magazine cover design. Also, seriously Oprah, I can see putting yourself on the cover for the first year or two, but it’s been a f*cking decade! Let it go already! Give someone else a turn, you selfish brat. What am I saying?! I must be nuts. Love you, O! Please don’t send your flying monkeys to kill or maim me. Okay, I will give you points for saying that someone other than Oprah should be on the cover of the mag, but the GIANT v on the other one is distracting. It is pretty much a GIANT watermark that takes away from the cover instead of adding to it. One other thing about O. 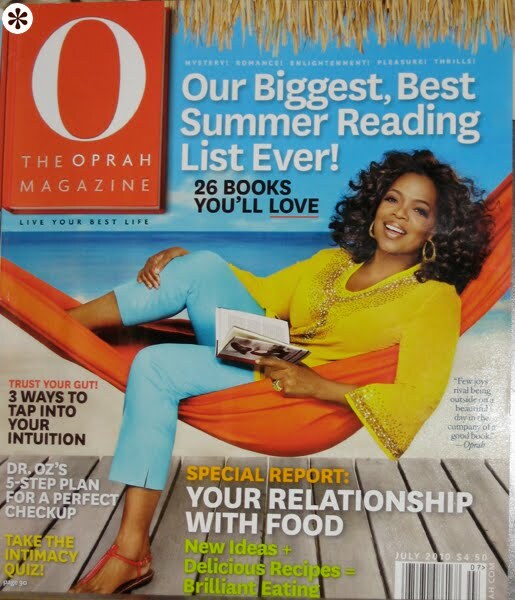 Is it just me or does Oprah look a "wee" bit shopped in that photo? By that i mean he legs don't look like they are positioned in the right spot for the way she is sitting. Definitely photoshopped. Oprah's legs look weird....looks like left is on the right? Are you being ironic with the big V? (are you being as ironic as the designer?) If you are getting into magazine cover designs, I don't think either of these samples are "pretty". No, I'm not being ironic. I genuinely appreciate the way V puts their V across the whole cover. It's bold, and different. My critique is more about the cover designs for these magazines overall (i.e. year round), not of these specific covers so much. Feel free to make your point if you disagree. Dude! It's Oprah's magazine. It's not a fashion magazine (models on cover) or a celebrity magazine (celebrities on cover). She did that Ellen one when Ellen pushed for it, which was funny & awesome. Also, I like the Oprah logo - I find it lovely and strong. It's not too modern and not too traditional. I often like big thicks-n-thin serifs mixed in with a clean sans serif. I am a supporter of this, and find it prtty. Also, I may have just made it too evident that I love Oprah, a lot. I too like the big V.